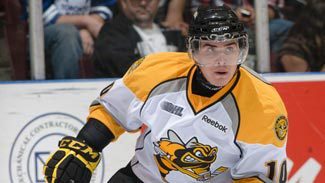 It should come as no surprise that right wing Nail Yakupov of the Ontario Hockey League's Sarnia Sting has been tabbed the top North American skater eligible for 2012 NHL Draft by NHL Central Scouting. Yakupov, 18, was the top prospect on Central Scouting's preliminary list of the top 25 skaters from the OHL in November and was regarded as the No. 1 North American skater on January's mid-term report. Yakupov has done nothing to disappoint the scouts this season. "His first step and ability to control bouncing pucks, knock them down and make a play are the best of any of the guys in the draft," said Central Scouting's Chris Edwards. "He really gets up to top speed very quickly and his hands are outstanding. Like Pavel Bure, Yakupov is dangerous every shift. He may not have been dominant on every shift like Bure was, but he created something every shift … you have to be aware where he is on the ice all the time." Hardly a peep was heard when Yakupov's name was placed at the top during Central Scouting's final meetings last week to determine the top 210 North American skaters and 30 goalies eligible for the 2012 NHL Draft, which will be held June 22-23 at Consol Energy Center in Pittsburgh. Yakupov finished third on the team with 69 points, including 31 goals, in 42 games for the Sting this season. He also has a plus-15 rating and 12 power-play goals. He added two goals and three assists in six OHL playoff games. After Yakupov, the discussions heated up. In the end, it was determined that defenseman Ryan Murray of the Everett Silvertips would supplant center Mikhail Grigorenko of the Quebec Remparts as the No. 2 skater on the list. Grigorenko was slotted at No. 3, followed by Sarnia center Alex Galchenyuk and Moose Jaw Warriors defenseman Morgan Rielly. What pushed Murray ahead of Grigorenko? "What you're going to get in Murray is clear cut," said Central Scouting's Peter Sullivan. "He's a safe defenseman who is effective in all areas of the ice. He led the team in scoring in the playoffs [three goals, five points], and that's not even his forte. He's not a real offensive-defenseman, but he skates as well as any offensive defenseman, and that's how he gets the puck out of trouble. "He's able to calm things down in his own end … he sees the game at a different pace." Murray, the first of six defensemen listed among the top 10 North American skaters, had nine goals and 31 points in 46 regular-season games. In his first season in North America, Grigorenko impressed with 40 goals, 85 points and a plus-35 rating for the Remparts of the Quebec Major Junior Hockey League. "He's the type of player that controls the whole pace of the game, can play with the puck at the same pace he plays without the puck, and sees the ice and his opportunities really well," said Central Scouting's David Gregory. "He can hang onto it longer than most players; he has the patience and the ability to see opportunities and let them develop, which is a really special skill." Galchenyuk, who didn't make his regular-season debut until March 14 because of October surgery to repair a torn anterior cruciate ligament, played just one game before departing a March 16 game against the London Knights with an upper-body injury. He returned for the playoffs, totaling two goals and two assists in six games. Like Galchenyuk, Rielly missed most of the season while recovering from a torn ACL in a Nov. 6 game against the Calgary Hitmen. In 18 games prior to the injury, he had three goals and 15 assists. "I've seen Rielly do things on the ice that nobody else was doing," Central Scouting's B.J. MacDonald said. 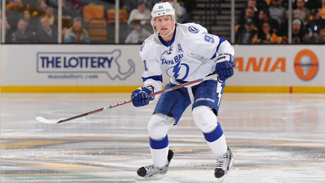 "I saw him make those little passes to guys who weren't expecting the puck to get there. He's the type of player who can lead the rush and he'll be the first guy back. I think his creativity makes him one of the top players in the league. He's like a chess player; he sees stuff coming that a lot of players don't see." Rounding out the top 10 are defenseman Cody Ceci of the Ottawa 67's (OHL), center Radek Faksa of the Kitchener Rangers (OHL), defenseman Olli Maatta of the London Knights (OHL), defenseman Jacob Trouba of the U.S. Under-18 National Team Development Program, and defenseman Griffin Reinhart of the Edmonton Oil Kings (WHL). Trouba, who had eight goals and 29 points in 47 games for the USNTDP, was the first player listed from the United States Hockey League. "He stepped in and showed leadership, showed unbelievable skill and an ability to carry the puck, lug the puck, defend and be tough," Gregory said of Trouba. "He's a complete package-type defenseman and skates so well that he'll make someone very happy in this draft." Making the biggest jump into the top 10 was Ceci, who was No. 16 in the mid-term rankings. The 6-foot-2 1/2, 207-pounder finished with a career-high 17 goals, 43 assists, 60 points and a plus-21 rating. "We did have discussions about Ceci in midseason," Central Scouting Director Dan Marr told NHL.com. "Were we being too hard on him? Maybe we should have had him higher, but he landed where he landed. We knew going into the second half that this could be a player who would move up as the season went along." Every scout was in agreement. "I thought Cody did a great job of understanding when to be up ice and when to defend and he did both things better in the second half," Gregory said. "When you recognize that, and have that whole package, then you have to be considered highly. We started realizing that as the second half was progressing. We're comfortable in saying that this is a heck of a hockey player. He's someone we have to recognize and teams need to know what we think." The highest-rated high-school player is Cristoval 'Boo' Nieves of Kent School in Connecticut. Nieves, a 6-2.75, 184-pound center, moved up four spots from the mid-term rankings to No. 27 on the final list. There was no change at the top of Central Scouting's final North American goaltender rankings as Malcolm Subban of the Belleville Bulls (OHL) earned the No. 1 ranking. Brandon Whitney of the Victoriaville Tigres (QMJHL) moved up one rung to No. 2 on the list. Rounding out the top five are Jake Paterson of Saginaw (OHL), Anthony Stolarz of Corpus Christi (NAHL) and Francois Tremblay of Val-d'Or (QMJHL). The top three skaters on Central Scouting's final international ratings are forwards: Filip Forsberg of Leksand in Sweden, Teuvo Teravainen of Jokerit Jr. in Finland, and Sebastian Collberg of Frolunda Jr. in Sweden. The highly regarded Forsberg, who had eight goals, 17 points and a plus-3 rating in 43 games, could be drafted among the top five this June. Teravainen (5-foot-11, 165) made the biggest jump, advancing five slots from No. 7 at the mid-term. "Teuvo has greatly improved over the course of the season," Director of European Scouting Goran Stubb told NHL.com. "He started with the juniors and then was a regular with a strong Jokerit team in the Finnish league after the Christmas break. "He's a player with outstanding hockey sense and great overall skill level," Stubb said. "He's 17 years old, but running the power play. He's a finesse type of player, not overly physical, but is not intimidated in a physical game. He can score and pass, is a good skater with fine acceleration, soft hands, and he knows his defensive duties." The top three international goalies are Andrei Vasilevski of Ufa 2 in Russia, Oscar Dansk of Brynas Jr. in Sweden and Joonas Korpisalo of Jokerit Jr. in Finland. It's possible Vasilevski could be the first goalie taken off the board, ahead of Subban. In seven games for silver medal-winning Russia at the 2012 World Junior Championship, he finished 5-2 with a 2.01 goals-against average, two shutouts, and .958 save percentage. "He's a big guy with excellent size and that helps him cover the net very well," Stubb said. "His angels and positional play are excellent and he has very good instincts, reads the game well. He's a game-winning goalie and will be the key player for Russia at U-18 World Junior tourney in the Czech Republic [April 12-22]."